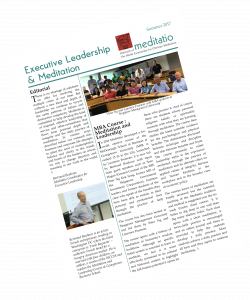 The Summer 2017 issue of “Executive Leadership & Meditation” has been released. This issue includes an editorial by Bertrand Bouhour, the Meditatio Coordinator for Executive Leadership, an articles on the MBA course “Meditation and Leadership” taught at the McDonough School of Business at Georgetown University. the Leading from the Centre programme, and information on the Meditatio foundation and seminars. For more information, click here. Concession places £30 offered to students, OAPs and the Unwaged. So much of modern identity revolves around the polarity of the local and the global. In Community we can experience the reconciliation of these oppositions. This Meditatio Seminar witnesses to the new forms of community which are being produced by modern life-styles. Different as they are, the speakers in the Seminar share a common contemplative view of love as the source of communion. The day will consist of two key note talks and interactive workshops. Contributors will include Laurence Freeman (Benedictine Monk and Director of The World Community for Christian Meditation), Peter Tyler (Author and Professor at St Mary’s University), Josie von Zitezwitz (Benedictine Oblate); member from L’Arche community; Skyler Gibbon and Samuel Murillo-Torres from the Community of St Anselm, Lambeth Palace. Laurence Freeman’s recent talk in Singapore at the Singapore Management University about Meditation for a More Humane World has just been made available on SoundCloud. Laurence talks about the simultaneous simplicity and difficulty of meditation, global forces that reshape our existence, and how meditation can help us learn to see ourselves and our actions/interactions within a global perspective.